This book fills the void left by my oft-used “arboricultural bible”: Arboriculture; Integrated management of landscape trees, shrubs, and vines (Harris, R. W., J. R. Clark, and N. P. Matheny. 2004. Prentice Hall). Applied Tree Biology can be used as a college level textbook or as an in-depth reference for practitioners. Applied Tree Biology is divided into 10 chapters with references listed at the end of each one. The first chapter introduces the reader to the benefits of trees and the importance of proper management to realize their environmental contributions. Chapters 2, 3 and 4 address the morphological, anatomical, and physiological components of trees. Hirons and Thomas take the reader on a study of the above- and below-ground features of trees. Chapter 5, “The next generation of trees: From seeds to planting” explores the science of reproduction—from flowering to fruiting, and then transitions to the commercial production of trees via sexual (seed) and asexual propagation (cuttings) methods. This chapter concludes with a discussion of production nursery techniques that lead to quality transplants and arboricultural practices in the landscape that contribute to successful establishment. I particularly enjoyed reading the “Tree Species Selection” and “Tree Quality” sections: two important topics that are essential to urban plantings. Chapters 6 and 7 are science-heavy chapters that address water and carbon relations in trees, respectively. The authors discuss the movement and use of water by trees. While the hydraulic redistribution section took some effort to comprehend, I was enlightened by its important role in tree survival, especially in mature trees. The discussion of photosynthesis and the impacts of light, temperature, and minerals on this carbon sequestration process in chapter 7 enhanced my respect and appreciation for plant physiologists. Carbon movement in the phloem and the production, use, and storage of carbon in trees round out this chapter. I felt more comfortable reading chapter 8, which discusses mineral (nutrition) uptake, influences on nutrient availability, and fertilization. Chapter 9 is another favorite as Hirons and Thomas write about the interactions of trees with beneficial and harmful organisms that include bacteria, fungi, insects, birds, and mammals. The “Defence of stems” (note the British spelling which can be found throughout the book) section took a refreshing look at CODIT and the management of decay in trees. In Chapter 10, the final chapter, “Environmental challenges for trees,” the authors cover a variety of abiotic factors that challenge trees. I enjoyed learning about the ingenious mechanisms employed by trees to help them cope with environmental challenges that can limit their performance in natural and built environments. Replete with dozens of graphs, tables, illustrations, and photographs, Applied Tree Biology is a pleasure to view and read. It also reinforces my respect and passion for trees. Plants with style: A plantsman’s choices for a vibrant, 21st century garden (by Kelly Norris, Dec. 2015, Timber Press, Portland, OR; paperback $24.95. I agree: garden where you live. So after enjoying this rousing entrée to the book, the reader encounters the following five vague-sounding chapters: “Environment: planting at the intersection of place and ecology, “ “Structure: Living Framework,” “Emblems: Keeping Pace with the Seasons,” “Vignettes: Expressing Yourself in the Garden,” and “Essential Kitsch: Horticultural Odds and Ends.” Each of these chapters showcases a wide assortment of herbaceous annuals and perennials and woody shrubs and trees. Norris celebrates the beauty and utility of these plants with his engaging, informative text. At times, he prognosticates about the performance of a particular plant or cultivar and states whether it will thrive or perish in the Southeast. At other times, the reader is expected to do their own research to determine if a particular species that performs splendidly in Iowa and the upper Midwest can be expected to survive a South Carolina summer. Norris attempts to satisfy a national audience with his plant descriptions and observations, but I feel that he falls short. His Midwestern bias is palpable and difficult for me to overcome. (My mother-in-law grew up in Lincoln, Nebraska, so I harbor no ill-will towards Midwesterners.) Unfortunately, as I read the book I found myself muttering, “Will it grow around here?” I also wondered about its availability. Do I have to purchase this plant via the web or could I find it at a local independent garden center? I’ve experienced enough heartbreak when I fall in love with a particular cultivar and discover that it’s nowhere to be found. Nevertheless, I will continue to nurture my curiosity and passion for new and uncommon plants. The book contains many photographs—in fact, there’s at least one photo on every page. Some are wide shots of plants taken in the context of a landscape with its companions, while others are close-ups of leaves and flowers. For the most part, the photos are luscious and crisp, such as the gorgeous dew-covered flowers of coral honeysuckle. Although the nonglossy pages fail to illuminate the images, Norris’ deft writing accentuates the beauty and virtues of the plants. As stated in a press release from the publisher, the author “wanted a book that not only informs people along the way but also entertains them with rich prose and photography that titillates their imagination and curiosity for plants.” Kelly Norris did that, but in this case, the prose takes precedence over the plants. Urban Forestry: Planning and Managing Urban Greenspaces. 3rd ed. Robert W. Miller, Richard J. Hauer, and Les P. Werner. 2015. Waveland Press, Inc., Long Grove, IL. 560 pages incl. appendices, glossary, index, b/w photographs, and illustrations. $69.95, S oftcover. In the preface to Urban Forestry: Planning and Managing Urban Greenspaces, the authors write that “the intent of this book is to address how to plan for, establish, and manage urban and community trees, forests, and other elements of nature in the urban ecosystem.” The authors have done just that in a clearly written and comprehensive reference book that would be of interest to students and practitioners alike. The book is divided into three parts. Part 1, Introduction to Urban Forestry, is a must-read for students and career-changers. In the first two chapters, “The urban forest: an introduction” and “Evolution of cities in urban forestry”, the authors define urban forestry and discuss the organizations involved in this field. I found the backstory regarding the evolution of urban forests on the national and global scale to be an informative and entertaining read. In Chapters 3 and 4, “Social Needs and Values of Urban Society” and “Functional Uses and Design of Urban Vegetation”, respectively, the authors address the environmental, economic, psychological and social contributions of our urban forests. Part 2, “Appraisal and value of urban vegetation’, is a must-read for city planners, civil engineers, landscape architects, city managers. In the three chapters that comprise this section: “Values of urban vegetation”, “Street tree Inventories and assessment,” and “Urban forest, tree canopy, and regional ecosystem assessment”, the authors emphasize the importance of using street tree inventories as the basis for tree management plans. They address a variety of inventory systems from the least to the most expensive, and provide a detailed examination of documenting vegetation and natural resources with air and ground surveys. Part 3, “Planning for and Management of Urban Vegetation” is the largest section of the book. Chapters 8-10 cover policy and planning issues, vegetation ordinances and laws, and information on developing urban forest management plans. The black-and-white photos and figures used throughout the book are especially helpful in this section. They complement the text and illustrate theoretical concepts to help the reader comprehend the information. I was surprised that the authors did not mention more recent references, such as James Urban’s Up by Roots (ISA, 2008), Dr. Ed Gilman’s 3rd ed. of An Illustrated Guide to Pruning (Delmar, 2012; the authors reference his 2002 edition) and Gilman’s web site (http://hort.ifas.ufl.edu/woody/index.shtml), The Practical Science of Planting Trees by Drs. Gary Watson and E. B. Himelick (2013, ISA), and Peter Trowbridge and Nina L. Bassuk (Wiley, 2004). While most of the black-and-white photos and figures compliment the text in this book, some photos in these two chapters, especially the ones that included graphs from scientific journals, had terse captions and were inadequately explained in the text. One photo depicted a reduction cut yet the caption identified it as a subordination cut. Despite the shortcomings on the arboricultural front, I found the business aspects of urban forestry to be highly informative as the authors discussed record-keeping, costs, contracts, and scheduling. In Chapter 13, “Program administration and analysis,” the authors deftly address the administration and management of urban forestry programs by focusing on funding, organizational structures, program analysis, personnel administration, and public relations. Chapter 14, “Management of park and open space vegetation” provides information on managing forest ecosystems on public and private lands. The final chapter addresses the trends, innovations, and basic management principles of private sector industries with a greater emphasis on utility arboriculture. The book has 8 appendices which include sample ordinances, tree pruning specifications, and samples of customer newsletters. This comprehensive textbook on urban forestry far exceeds the content in the Municipal Specialist Certification Study Guide (2008, Metheny and Clark, ISA). It’s a book that I will use for teaching urban forestry students; however, it can also be used to train allied professionals engaged in the planning, establishment, and maintenance of urban forests. Reprinted from “For Students and Practitioners Alike: A Book Review.” Polomski, R. F. City Trees (Journal of the Society of Municipal Arborists). Nov/Dec. 2015. 51(6):34-35. Foodscaping: practical and innovative ways to create an edible landscape. Charlie Nardozzi. Cool Springs Press: May 6, 2015, paperback, 176 Pages; $24.99; ISBN: 978-1591866275; 171 color photos. “a yard that is both productive and beautiful.” Her seminal book erased the lines that separate edibles from ornamentals and ultimately changed how Americans look at fruit trees, squash vines, and flowering herbs. Following Creasy’s footsteps is Charlie Nardozzi with Foodscaping: practical and innovative ways to create an edible landscape. He sums up the premise of his book in the Introduction: “Foodscaping is integrating edibles into your gardens without sacrificing beauty. It’s a great way to produce food for yourself and your community and still have the beauty and functionality you want in the landscape.” Nardozzi writes with a reassuring tone and gains your trust immediately. The author makes you believe that it’s possible to grow food without sacrificing beauty. Nardozzi admits that his book is not the ultimate resource for foodscapers, so he provides a section on Supplies and Resources for gardeners to delve further into specific variety recommendations or cultural practices. Rounding out this 176-page book is the USDA Hardiness Zone map, Glossary, and Index. If you’re a garden center operator who carries edibles as well as “crossover” vines, ground covers, shrubs, and trees that are ornamentally attractive and produce tasty and nutritious fruits, make this book available to your garden designers and customers. Charlie Nardozzi’s Foodscaping will help them create an edible landscape that tastes as good as it looks. “Foodscaping: Practical and innovative ways to create an edible landscape”. Book Review. p. 39. The South Carolina Nurseryman. Sept/Oct 2015. Gardening For Geeks by Christy Wilhelmi, April 2013, Adams Media, Paperback $15.95, 224 pages, ISBN: 978-1440557798. I admit, I am intrigued by the title of this book. As a self-professed “plant geek” who has met other likeminded individuals (you know who you are), I had to read this book. This book is for beginning gardeners. Despite the California undertones, your new customers—newbie and wannabe gardeners who’re seeking relief from the Great Recession by growing their own edibles at home, will enjoy this book. The engaging and informative text is laid-out with attractive, inspiring photographs. In a nonthreatening–even entertaining manner—Wilhelmi introduces the reader to basic gardening concepts and practices. Gardening For Geeks is divided into 10 chapters, 4 appendices, a Bibliography and Resources section, a three-page Glossary, and an Index. The chapters take the reader through the planning, planting, growing, and harvesting of vegetables and herbs process. Other chapters provide the reader with an overview of soil, gardening in small spaces, and irrigation. Reflecting its national scope, the “Planning your Garden Season” chapter introduces the reader to warm/hot season crops and cool season crops. “Planting Nitty-Gritty” discusses planting techniques for seed and transplants. The “All about seeds: heirloom, open-pollinated, and hybrid seeds” text box is a must-read for anyone interested in definitions of heirloom, open-pollinated, hybrid, , and GMOs. Wilhelmi’s gift is to succinctly break-down complex terms and concepts into easy-to-understand language. I’m also fond of the “baseball card stats” approach to describing a variety of vegetables that range from arugula to tomatoes, and herbs from basil to thyme. This book is written for a national audience, so look elsewhere for region-specific details. A bonus in each chapter are the clever “Geeky Gardening Tips” that provide gee- whiz tips, such as using your desktop computer as a compass, conducting germination tests on stored seeds, and preventing cutworms with toilet paper or paper towel rolls. Garden geeks will appreciate the renaming of “fast composting” (see Composting, HGIC 1600 [http://www.clemson.edu/extension/hgic/]) to the geekified “Active Batch Thermal Composting”. I particularly enjoyed the flow chart in Chapter 9, Pest Control.” The chart begins with the heading “Problem with my plant”, and then through a stepwise decision-making process involving “yes” or “no” responses,” helps the reader identify and manage the problem. Sure, it’s an extremely cursory view of pest management that won’t solve all of the problems encountered in vegetable gardens, but it’s a bold first step at providing the reader with an IPM-based decision-making process involved in growing vegetables and herbs. (By the way, I only found one error in the book [Epsom salts will not prevent blossom-end rot, which is a disorder and not a disease]). Despite the ominous title, Gardening for Geeks is part of a growing trend of putting the fun back into gardening. As I see it, you don’t have to be a plant geek to enjoy this book.—Horticulturist and garden writer, Bob Polomski, is the co-author of Carolinas Gardener’s Handbook: All You Need to Know to Plan, Plant & Maintain a Carolina Garden. Visit his blog at www.bobpolomski.com. Reprinted from “Gardening for Geeks. Book review by Bob Polomski.” The South Carolina Nurseryman. July/Aug 2013. p. 22. A Four-season Southern Garden. Betty Montgomery. 2013. James-Richards, Spartanburg, SC. $24.95 hardcover; 127 p.; ISBN-978-0-578-12985-3). Since I arrived in South Carolina more than two decades ago, I’ve never forgotten this advice from John Elsley: “In order to become successful gardeners, people must learn to garden where they live.” He’s right. Since the mid- to late 1990s, I’ve witnessed the growth of the regional gardening movement. Magazines with national circulations began to include region-based articles and writers in their pages. State-by-state gardening magazines were born with local garden writers supplying copy and photographs. Over the years I’ve had the pleasure of meeting and reading gardening books written by South Carolinians, such as Jim Wilson, Orene Horton, Margot Rochester, Linda Cobb, Bob Head, and Patricia Moore-Pastides. I can add another South Carolina garden writer to my list: Betty Montgomery. A Four-season Southern Garden is about garden plants that thrive in zone 7. Montgomery divided the book into seasons: Winter (January to March), Spring (March to May), Summer (June to August), and Fall (September to December). In each season she writes about noteworthy plants that take front-and-center during that particular time of year. She writes about bulbs and perennials, shrubs and trees, vines, ferns, bulbs and perennials that flower in the sun, flowers that self-seed, late-blooming flowering plants, and perennials that take shade. I particularly enjoyed reading about the “Betty’s Pick” plants. These author favorites–azaleas, hydrangeas, and conifers—receive special treatment as she discusses favorite cultivars and offers cultural pointers, design tips, and other helpful advice that will ensure their successful establishment in your own garden. Montgomery writes with a comfortable, conversational tone with generous undertones of experience. Her gift is her ability to convince me that I should add a particular plant to my own garden or to compliment me for astutely making the right choice with a certain species or cultivar. I found a few shortcomings with this book. Because I have a penchant for correct scientific names that are spelled correctly (after all, I am a college instructor), I noticed a few of the scientific names were outdated and others were misspelled. Also, I was disappointed that there was no index. 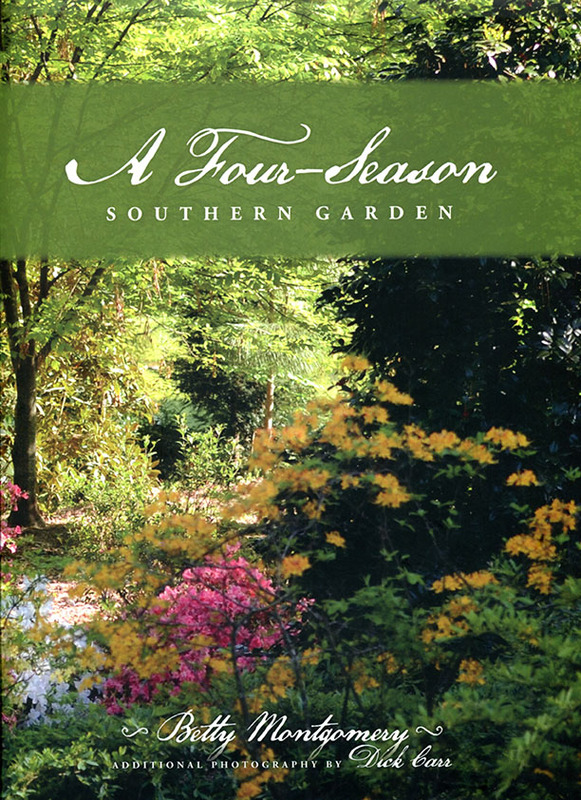 Reprinted from: “Book review: A four-season southern garden by Betty Montgomery.” The SC Nurseryman July/Aug 2014, p. 18. An Illustrated Guide to Pruning. 3rd ed. Edward F. Gilman. 2012. Delmar, Cengage Learning, Clifton Park, NY. 476 pages incl. appendices, glossary, index, full-color photographs, and illustrations. $129.95, Softcover. ISBN-13: 978-1-111-30730-1. “Pruning is both an art and a science” is an adage that appears in a multitude of print and electronic publications. However, proper pruning—artistic expression coupled with research-based techniques—needs to be practiced more widely in nurseries, landscapes, and streetscapes. In fact, a prevailing idea (especially among the nescient) is that if you can afford a pair of loppers or a chainsaw, you know how to prune shrubs and trees properly. Sadly, we know that concept is not true. Pruning is a skill that requires knowledge and practice. Happily, Gilman hit a grand slam with his 3rd edition of An Illustrated Guide to Pruning. Comprised of 18 chapters, nine appendices, a glossary, and 115 references, An Illustrated Guide to Pruning is, in my opinion, the pruning bible for nurserymen, horticulturists, and arborists. The first four chapters provide introductory information: pruning objectives and strategies; ways to minimize pruning needs with appropriate plant selection, placement, and management; and understanding the impacts of pruning on shrub and tree biology and health. Chapters 5 through 7 define and explain the implications of three pruning cuts—reduction, heading, and removal cuts, various types of pruning tools that range from shears to chainsaws, and timing—knowing when to prune fruit and ornamental trees from the nursery to the landscape. Nurserymen will be interested in chapters 8 and 9, which address nursery tree production strategies to develop quality trees with dominant leaders, well-spaced lateral branches, well-tapered trunks, and a uniform crown. Chapters 11 and 12 address the crux of An Illustrated Guide to Pruning—structural pruning. For years Dr. Gilman has written and spoken about the importance of structural or formative pruning to eliminate defects (such as codominant stems, low-growing branches), to increase the life span of a tree, and to reduce potential of a tree to harm people and property. For individuals who interact with trees from the nursery to the landscape, these two chapters address the concepts and practices involved in developing a tree with a strong architectural framework comprised of a dominant leader and well-spaced, supportive scaffold limbs. In the remaining chapters of the book, Gilman discusses approaches for pruning established, mature, and storm-damaged trees, provides detailed instructions for pruning specific trees that include crape myrtles, conifers, palms, and cycads, and offers techniques for pruning shrubs. Chapter 16, “Root Pruning and Management,” canvasses the scientific literature and introduces the reader to our current understanding of root growth and the effects of root pruning on regrowth in the nursery, at planting, and in the landscape environment. Typical of all of the chapters, Gilman deftly weaves the scientific literature into practitioner-friendly prose that enlightens and empowers the reader to employ the right techniques. A feature that raises the bar for currently available or impending pruning publications is Gilman’s use of more than 500 full-color photographs and illustrations that allow readers to visualize pruning techniques, terms, and concepts. In some of his illustrations Gilman simplifies his “how to” instructions by using red-colored branches to denote limbs that need to be removed. This clever use of color to teach readers how to make proper cuts reminds me of Ernie Christ’s 1975 Rutgers Cooperative Extension Bulletin (377-A): “How to prune young and bearing apple trees.” This simple use of color engages our visual senses and enhances the process of learning how to prune properly. The following nine appendices round-out this instructional manual: Nonconiferous trees requiring only moderate pruning to develop reasonably good structure; Trees often grown successfully with a multileader or multitrunk habit; Trees suited for training into a standard; Plants suited for espalier training; Sample pruning specifications; A schedule for training shade trees in the urban landscape (“Trees are like children; they require about 25 years of training to create good, solid structure that will last them a lifetime”); Nursery production protocol for upright trees; Trees that often form multiple trunks; and Handy cue cards for using in the field (which can also be downloaded at www.urbantree.org). An Illustrated Guide to Pruning can be used as a reference or as a companion textbook for teaching nursery production and arboriculture courses. 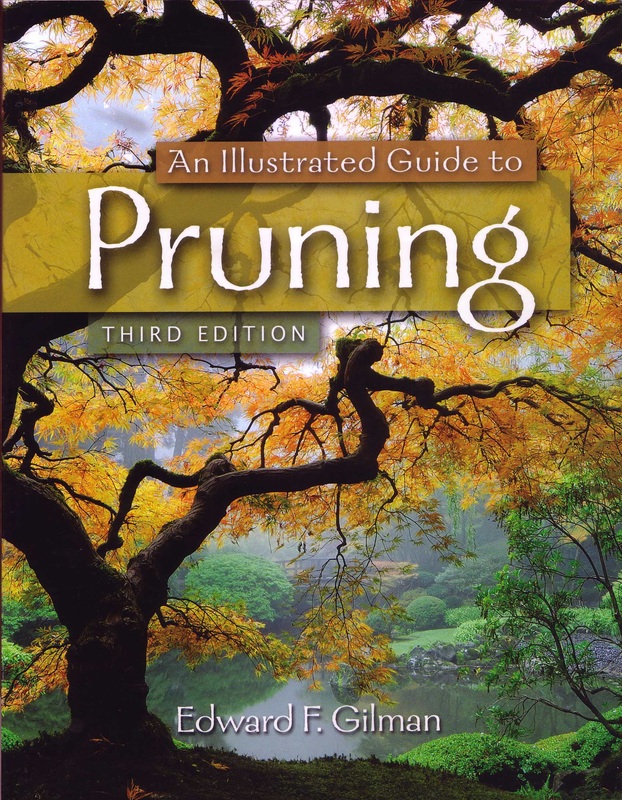 Very simply, it is a must-have book for anyone interested in learning or teaching the art and science of pruning. 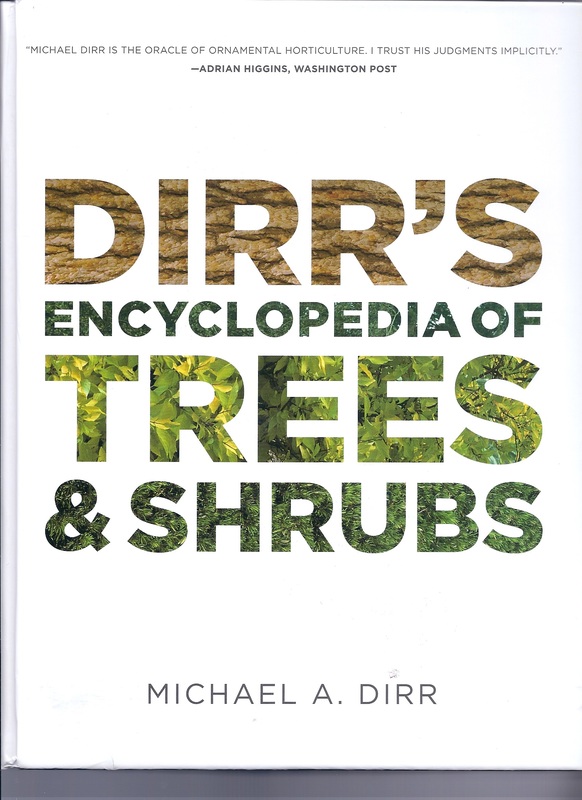 Dirr’s Encyclopedia of Trees & Shrubs. Michael A. Dirr. 2011. Timber Press, Portland, OR. 951 p., incl. indices (botanical and common names). $79.95 hardcover. ISBN-978-0-88192-901-0. The author made wholesale changes to the text and fortified it with higher quality photographs than in his two earlier books. Also, Dirr updated the botanical names (thankfully he included their synonyms), a taxonomic necessity that chafes horticulturists, especially students studying plant materials. The layout of the Encyclopedia is identical to Dirr’s Hardy and Warm Climates books with an A to Z arrangement of taxa from Abelia to Ziziphus jujube. Dirr writes each entry in an authoritative but conversational tone. The author succinctly discusses the overall appearance and use of a species, its height and width, identification features, such as leaf size and color, and ornamental attributes, such as fall leaf color, flowers, and fruits. Dirr also includes the USDA cold hardiness zone (avoiding the a and b designations) and native range. He also lists and briefly describes selected varieties and cultivars. Thankfully, he avoids a dry encyclopedic approach and retains his signature style that proves to be informative, entertaining, affectionate, reflective, opinionated, and empathetic. I counted 134 additional taxa that were not included in the Hardy or Warm Climates books. I was pleased to see Olea europaea in the Encyclopedia but disappointed that Citrus was not included despite the growing trend of cultivating hardy citrus by commercial and residential audiences. The expertly laid-out photos in the Encyclopedia trump the quality of photographs in his earlier books in terms of color and clarity. The wide shots of species and cultivars showcase their form and function in the landscape; the close-ups of leaves, flowers, and fruit beautifully complement the prose. The photographs are especially important to readers when Dirr describes lesser known, uncommon species that deserve widespread commercial acceptance. His compelling endorsement of obscure species and accompanying comments may lead readers to covet species that include Diervilla sessilifolia (“This species will doubtfully make anyone’s list of the top 50 flowering shrubs.”); Forestiera acuminate (“What is it? Who cares? Why is it here?”); and Picrasma quassiodes (“Rare. Worthy? I will allow the reader to decide. I have a plantsman’s affinity for the species and am at a loss to explain its remoteness in cultivation”). The Encyclopedia caters to green industry professionals, particularly landscape designers, landscape architects, grounds managers, and nursery and garden center operators, who will value it as a reference and a teaching and learning tool for their employees and customers. Serious gardeners with a facile use of botanical names also will cherish this book. As an instructor of a landscape plant materials course, I envision the Encyclopedia to be a supplement to but not a substitute for the Manual of Woody Landscape Plants. Users of the Encyclopedia will enjoy the 28-page section at the end of the “A–Z Encyclopedia of Trees and Shrubs” titled “Selecting Plants for Specific Characteristics or Purposes.” Dirr arranges the taxa in the Encyclopedia into the following 15 categories: flower color; flowering sequence; fragrant flowers; fruit color; fall color; winter interest; shade tolerance; salt tolerance; tolerance to moist or wet soils; tolerance to dry soils; street and urban planting; hedging; evergreens for specimens; grouping; screens and groves; weeping or fastigiated/columnar habit; and vines for flowers, fruit and fall color. The reader can refer to any of these lists to select appropriate plants for particular purposes and designs and then refer to the A–Z directory for more information. For its informative and engaging prose interspersed with more than 3,500 photographs, the Encyclopedia has earned a spot on my desk. Reprinted from R. F. Polomski. 2012. Book Reviews. HortScience 47(7):969-970. Edible Landscaping. Rosalind Creasy. 2010. Sierra Club Books. $39.95 paperback. ISBN 978-1-57805-154-0. More than 300 color photographs, 7 color garden plans, and 20 b/w illustrations. Over a quarter century ago Rosalind Creasy, author of The Complete Book of Edible Landscaping, popularized the concept of landscaping with edible plants: “a yard that is both productive and beautiful.” Her seminal book erased the lines that separate edibles from ornamentals and ultimately changed how Americans look at fruit trees, squash vines, and flowering herbs. Supporting Creasy’s movement is the continuous introduction of colorful, eye-catching vegetable varieties that offer sustenance and beauty (such as purple cauliflower [‘Graffiti’], burgundy asparagus [‘Purple Passion’], red mustard greens [‘Ruby Streaks’], purplish-red Brussels sprouts [‘Falstaff’], and lemon-yellow cucumbers [‘Lemon’]). The global recession ignited further interest in edibles. (Growing vegetables on the South Lawn of the White House also brought attention to the homegrown food crusade). Now, Rosalind Creasy returns with a brand new book: Edible Landscaping: Now you can have your gorgeous garden and eat it too! (Sierra Club Books, 2010). Edible Landscaping is divided into eight chapters. Chapter 1, “The Evolution of Landscaping,” offers readers a historical tour of landscape design from its survivalist beginnings to its modernistic focus on aesthetics. Chapter 2, “Laying the Groundwork,” teaches the reader how to evaluate their soil, climate, and hardscape features. With this foundation underfoot, Creasy then launches into the next two chapters, “Creating a Landscape Plan” and “Design Basics.” The author presents a straightforward do-it-yourself approach to landscape design. Relying on case studies, Creasy uses landscapes in Arlington, VA, Vancouver, and Long Island, NY, to illustrate the design concepts and approaches required to convert conventional landscapes into sustainable, edible ones. The “Design Basics” chapter is chock-full of beautiful photos that showcase design principles. I was smitten by a photo that at first glance appeared to be an attractive, colorful landscape. Upon closer inspection I discovered ‘Ruby’ chard, savoy cabbages, basil, and parsley, growing among red salvias and yellow marigolds on a canvas of manicured turfgrass. The combination of colors and textures united the edibles with the ornamentals to create an unforgettable vignette. Chapters 5 through 7 explains how to design with herbs, vegetables, fruits, berries, and nuts. Each chapter includes “A Gallery of Design Ideas” that uses exquisite photos to illustrate landscape design principles and elements. Chapter 8, “Designing for Small Spaces,” is an excellent chapter for people who are interested in small-scale gardening: containers, patios, mini-orchards, and water gardens. I liked the author’s step-by-step example of installing a 100 square foot garden vegetable and herb garden. Presented like a recipe that I’d find in one of Julia Child’s cookbooks, Creasy divides the project into “Materials,” “Plants,” and “Installation.” It can’t get any easier than that. The “Encyclopedia of Edibles” chapter offers a comprehensive look at acquiring, growing, harvesting, and using herbaceous and woody edibles that range from almonds to wheat. I like the “Effort Scale” for each crop, which ranges from “1” (minimal effort) to “5” (high maintenance and considerable effort). Interspersed in this chapter are photographs that include close-ups of the edible portion and wide shots of their use in the landscape. Already at 300 pages there’s enough information to enable anyone to create or retrofit an edible landscape. But there’s more. Creasy includes four appendices at the end of the book. Appendix A, “The Big List of Edible Plants,” provides quick snapshots of edible plants (such as “cultural conditions,” hardiness zones, “edible part,” and “landscape and cooking information”). Similarly, Appendix B, “Edible Plants for the Small Garden,” organizes the plants into tables with headings that include cultural tips such as sunlight exposure, “minimum container size,” and “recommended varieties or types.” Appendix C, Planting and Maintenance, and Appendix D, Pests and Diseases, offer planting, care, and container gardening information along with a discussion of garden pests, plant diseases, and natural products for pest control. Finally, the book wouldn’t be complete without the “Sources and Resource” section. Refer to these pages for information on sources for acquiring plants, a list of mail-order companies, sources for garden supplies and equipment, a list of organizations focused on edible plants, and a list of public gardens from around the country that offer education and inspiration. If you’re a garden center operator who carries edibles as well as “crossover” vines, ground covers, shrubs, and trees that are ornamentally attractive and produce tasty and nutritious fruits, consider making this book available to your customers. Rosalind Creasy’s Edible Landscaping will help them create an edible landscape that tastes as good as it looks. Polomski, B. 2011. 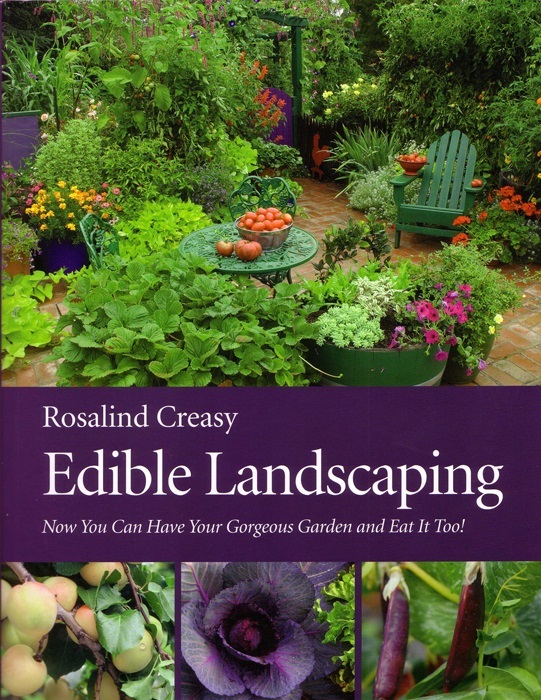 Book review: Rosalind Creasy’s Edible Landscaping. The SC Nurseryman, Jan/Feb, p. 19.